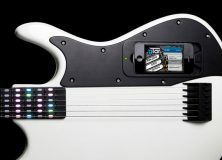 Jamstar Acoustics is a learning tool that will help to improve your playing with exercises, chords, scales, and songs, via iPhones, Androids, tablets, and computers. Using a format familiarly famous from most rhythm music video games, Jamstar Acoustics offers a feeling of familiarity with a less familiar feeling of accessibility and affordability. For your convenience I have documented my experiences with their software. When you first start working with the app you have to make an account with Jamstar Acoustics. You can either make an account with your Facebook or Twitter account, or you can make a whole separate account, which is what I did. 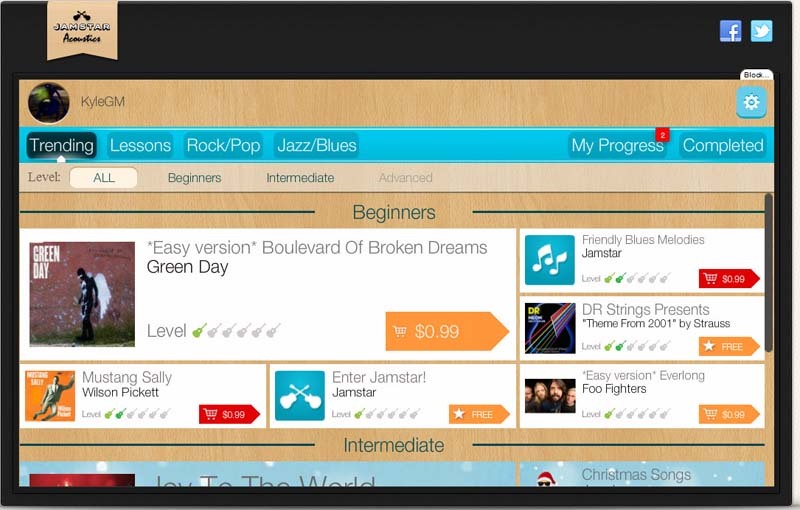 Anyone that’s had a one-on-one with Guitar Hero, Rock Band, or Rocksmith will notice a resemblance in Jamstar. 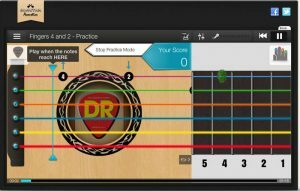 You have a backing track that holds the rhythm for you while markers – little dots that tell which string and fret to play – move across a fretboard and guitar body towards a line. When the markers get to the line you either hit the note with one semblance of accuracy or another or you miss it and Jamstar records how well you’re doing along the way. The name is Jamstar Acoustics, and everywhere I’ve looked I was given the impression that acoustic guitarists are the primary demographic. However, I’m more of a heavy metal electric guitarist than anything (and I just broke my last set of acoustic strings), so I needed to know if I could break this perceivable “rule” and use an electric. While I kept it simple and just used a clean channel, Jamstar did in fact pick up everything I played, so just in case you were wondering, electric guitarists are plenty welcome as well. Just don’t use any pitch shifting effects and you should be ok. When you first make an account Jamstar asks about your skill level from total beginner to intermediate to well established. Whenever I try something new experiences have taught me I’m best suited assuming the humbling guise of a moron. I chose the total beginner. Once I got into the app I was introduced to the tutorial mode. The tutorial walked me through the basics of how the app worked. It’s short, to the point, and comprehensive, and nothing more than it needs to be. Whenever you boot up Jamstar Acoustics the app runs you through a tuner. 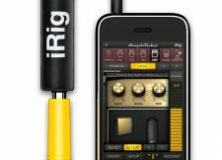 The app would listen and advise I tune up or down, one string at a time, until everything was ready to go. The end result sounded damn good to me. One thing I had noticed while tuning and playing was that the neck and headstock seemed upside down from how most tabs are presented. At first it threw me off, but it’s not really that difficult to get used to and you can swap it in the settings menu. Ok, once I got past the tutorial and the tuneup I started thumbing through the selection of songs and lessons. The selection of songs included a handful of tunes from Led Zeppelin, Green Day, The Muse, a few holiday-themed songs, and more. 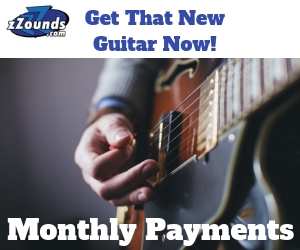 There are a handful of freebie tracks to learn on that will get you started, but most of the licensed music will run about $1 per track. The selection may be a bit limited for some, but Jamstar routinely updates and adds new songs, and it’ll fire off a notification to you whenever it does so. I played around with a few different tracks. Just to put things into perspective a bit more for you I began this review with a Samsung Galaxy S3 cell phone. At my disposal I also have an original Kindle Fire, but as of this writing Jamstar Acoustics is not available in Amazon’s app store. Besides, it wouldn’t matter anyway. The original Kindle Fires don’t have microphones, so I was left to use just my cell phone anyway. Out of curiosity I popped onto Jamstar’s web site figuring I could find a nifty press release or something that offered another point of view. To my surprise their web site works just like the cell phone. I was able to sign into my already created account and in seconds all of my already established progress was mapped out before me. This was good. This meant that I was no longer restricted to the smaller screen, battery life, or my phone’s trivial microphone. Instead I had stable power, a bigger screen, and my Shure SM57. By nature if I have my choice between a tablet, a cell phone, and a computer, 100% of the time I take my computer. Talk about a pleasant surprise. However this is probably where my biggest complaint with Jamstar has surfaced. 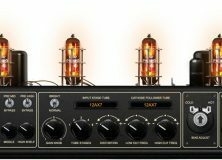 I love having the option to play around in Jamstar on my computer, but while the screen is bigger, it is not big enough. Basically they’ve wedged their web site interface into a rectangle giving it more of a tablet type presentation. This does not play to the strengths of the PC. If I maximize my browser on my 22-inch monitor I am offered no more surface area to work in. It’s a bit constricting for my tastes and it kind of got in the way of getting some more robust screenshots for this review. As I had said before, Jamstar Acoustics really presents itself in a game-like fashion. But unlike the Guitar Hero type games you’re using a real guitar, and unlike Rocksmith and newer iterations of Rock Band it doesn’t cost nearly as much, and it’s way more accessible. 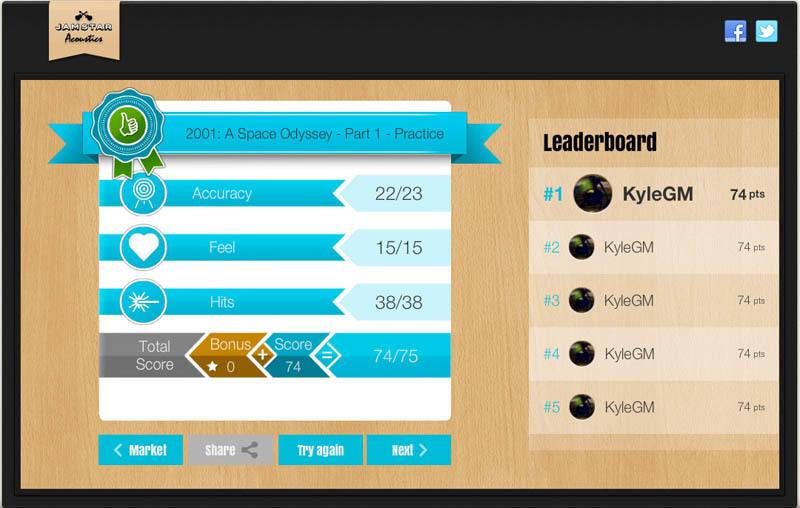 Plus you still get the benefit of leaderboards which can be nicely motivating. While the web interface left me with a bit to desire, it handled every bit as well as the app did on my cell phone. I did periodically have a few hiccups with the mic on my cell phone (a problem I’ve read others have had), but they seem to make frequent updates to the app correcting this and I never experienced this problem in such huge droves that it remotely hindered my experiences. But what really seals the deal with Jamstar is the price tag. Here’s why you should give Jamstar a shot completely regardless of what I say. It’s free. Seriously. I looked around and I didn’t come across any required permissions that seemed remotely intrusive either. With no money out of your pocket and no fear of shady data mining you have nothing to lose. 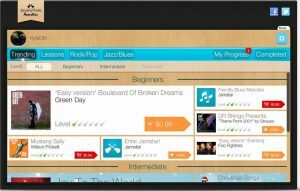 Sure there are licensed songs you have to pay for, but even that aside there are plenty of free tracks and lessons to give you a feel for how the app works. You really can’t lose. ← What Was the Big Deal About The Beatles?